Celebrate Renewable Solar Energy Lighting for the Great Outdoors! Gardening, golf, gatherings, and grigio (as in pinot grigio)! Get ready for sunshine and get-togethers. But remember, when darkness sets in and you're done having fun for the day, wouldn't it be great to sit back and relax on your deck, dock or patio with a refreshing beverage, admire your surroundings and actually see your friends? Wimpy solar lights just won't do. You want (and deserve) light that is bright enough to see the whites of their eyes as you describe your latest adventures, in detail. Explore free-light. We have an extensive collection of solar lighting products to satisfy every need for free, renewable, light that looks great, installs in seconds, brightens for hours and lasts for years. Wander through our catalogue and you'll be rewarded with SALE prices and FREE SHIPPING on many free-light solar lights. Remember to check customer reviews too! Light up all the areas around your home, office, cottage or camp. 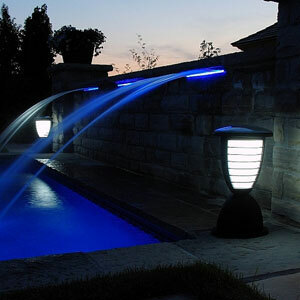 free-light solar lights are great for safety, security, and the illumination of walkways, pathways, tables, courtyards, patios, column and pillars driveways, gardens, decks, fence posts, landscape up-lighting, and stairs. no wires... just add sun! Learn more about Outdoor Solar Lighting Techniques and Effects.